This 14 digit business calculator with 2 independent addressable memories comes equipped with a large and easy-to-read display. Plus, the CS-4194H stores and calculates tax with one key while quickly and accurately computing tax and merchandise cost on returned goods. are keys shaped for fast and comfortable operation. Extra ease is provided by contoured Plus/Equal and Minus/Equal keys. 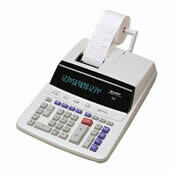 enables you to print 14 numerals, 2 symbols, and 3-digit punctuation at a speedy, approximately 4.8 lines/sec. in 2 colors (positive numbers in black, negative numbers in red) on standard size paper rolls. include a MU (Multiple Use) key that simplifies calculations, saving time and increasing efficiency by handling functions like margin, markup, selling prices, costs, percent changes, calculations, etc. This page is part of GeneralManual.Com Network SHARP CS-4194H Commercial Calculator User Manual.